I wanted to be a photographer when I was 15, but my mother said I could always take it up later – so that was that for 30 years! I ended up reading English at Oxford and working as a strategy consultant for a few years, both full-time and freelance, before 'retiring' at the age of 29! I then travelled round the world for seven years, doing four ski seasons and working on an internet start-up in San Francisco among other things, before finally returning to London in 2005. At that point, consulting work felt too stressful, so I decided to go 'qualify of life'. I'm now a private tutor and wildlife photographer, both of which came about quite by chance. I started tutoring in 2009 when I happened to read an article in the paper called 'Ten Ways to Beat the Recession', and I started taking pictures again in 2013 when I received a random email inviting me to go on safari and climb Mount Kenya. After investing in a decent camera, I've been a wildlife photographer ever since! I’ve taken pictures in 25 countries on all seven continents and won various awards including the Sunday Times/Audley Travel Big Shot competition. As well as taking pictures myself, I'm also available as a photographer/guide for those interested in private safaris, and you can find details of all the trips I'm leading on the Events page. My experience as a private tutor lets me be very patient and understanding with anyone who wants to get the best possible pictures on safari. On game drives, I'm always happy to answer questions, whether it’s about camera settings, the rules of composition or just identifying all the different species of wildlife. Back at the camp or lodge, I'll run various sessions to familiarise you with camera technique, provide feedback on your images, show you my ‘Shot of the Day’ and even invite you to take part in a photo competition. I want to produce the most beautiful and powerful images I can, and I won’t be satisfied until I've captured a few images I think are worth five stars. These are my absolute favourite shots, and I've only produced around 150 of them over the years, so these are the special ones, the ones I'm most proud of. They can show any subject – not just wildlife – but they must convey the magic of being there. I started out taking 'portraits' of animals. That was all very well, and a lion may look beautiful sitting on the African savannah or a jaguar prowling through the Brazilian Pantanal, but there isn't much energy in those pictures. What I try to do now is to produce 'action shots' when the bird or animal is in motion. I still take portraits - and sometimes you don't have a choice! - but my ideal image is much more likely to be a cheetah chasing down an impala than a bird perched on a branch! My favourite animals are the predators, and the wonder of the long lens is that it can fool people into thinking they are right up close and personal with a very dangerous beast. It’s that sense of excitement that I try to capture in my work, and I'm happy to use whatever technology I can find to do the job. I regularly rent an 800mm Nikon lens for close-up shots, and I've just bought a Nikon D850 camera body with a 45.7 megapixel sensor and the ability to shoot nine frames per second. All that, combined with the wonders of Lightroom, gives me the best possible platform for capturing the power and beauty of the animal kingdom. If you’d like to rent or buy a print or hire me for a talk, a lesson, a photo shoot or a safari, please contact me on +44 7942 800921 or at nick@nickdalephotography.com. 45 x 33cm/18 x 13"
This image has been sold over 1,000 times and won first place in Art Room Gallery's 'Nature' competition in March 2018 (see video). 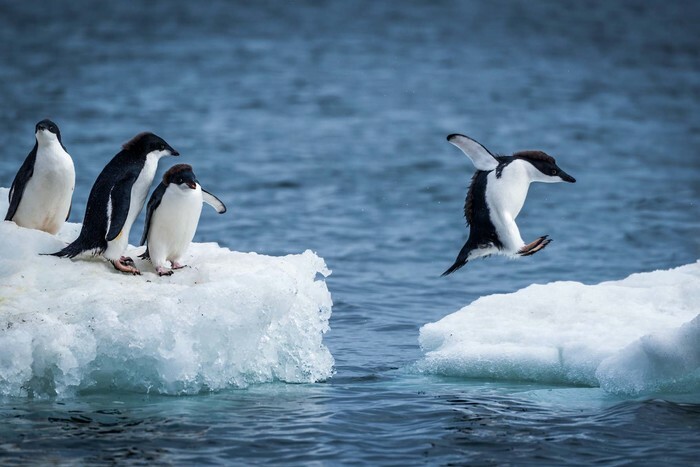 It was also among the editors' favourites in the National Geographic Nature Photographer of the Year Contest 2016, won a Gold Award in the August 2017 Monthly Photographic Competition run by the Society of Photographers, was twice runner-up in The Daily Telegraph's weekly Big Picture competition (here and here), was a finalist in the Fusion Art Open Art Exhibition (see video) and was Highly Commended in SINWP's Our Colourful World Photography Competition. 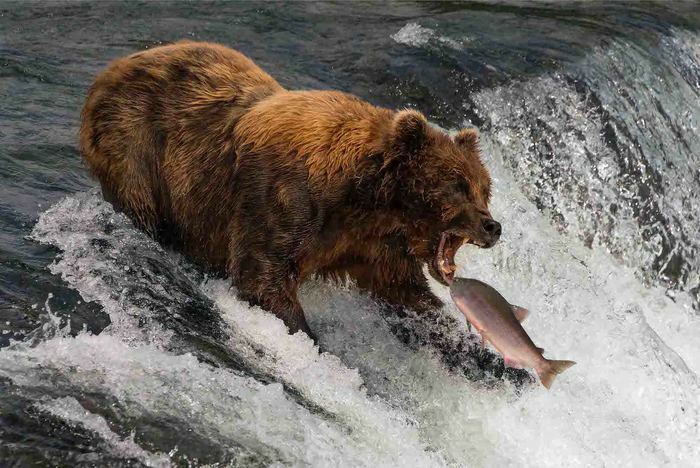 135 x 97cm/53 x 38"
A brown bear with shaggy, brown fur is about to catch a salmon in its mouth at the top of Brooks Falls, Alaska. The fish is only a few inches away from its gaping jaws. Shot with a Nikon D800 in Alaska, USA, in July 2015. 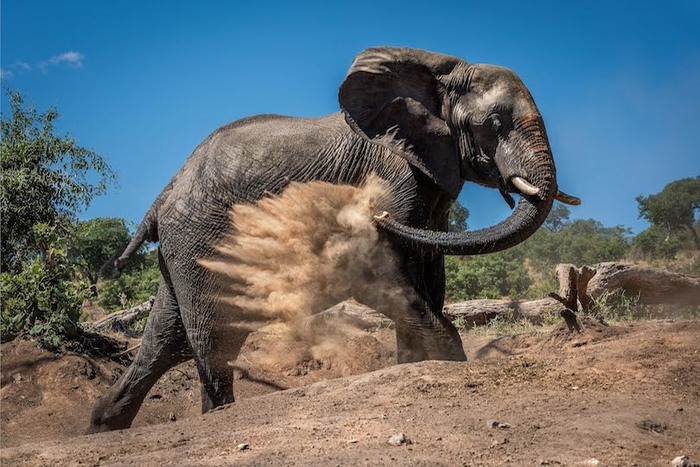 This image won the Sunday Times/Audley Travel Big Shot competition in January 2017, won first place in Art Room Gallery's 'Nature' competition in March 2018 (see video), was a finalist in Fusion Art's 3rd Annual Animal Kingdom Art Exhibition in January 2018 (see video), was National Geographic's Photo of the Day on 2 August 2017 after being chosen in their Daily Dozen and was among the editors' favourites for Week 10 of their Travel Photographer of the Year competition. It also received nearly 25,000 likes on their Instagram page! It was also third in the Xposure 2017 Wildlife Photography Competition, commended in Photocrowd's 'The Colour Brown' competition, Highly Commended in SINWP's Wonders of Wildlife competition, given an Honourable Mention in the 2017 Neutral Density Photography Awards, chosen as an Editors' Pick in the ZEISS Photography Award 2018 and awarded a Mark of Excellence by the judges for the I SHOT IT Wildlife Photo Competition 2017. 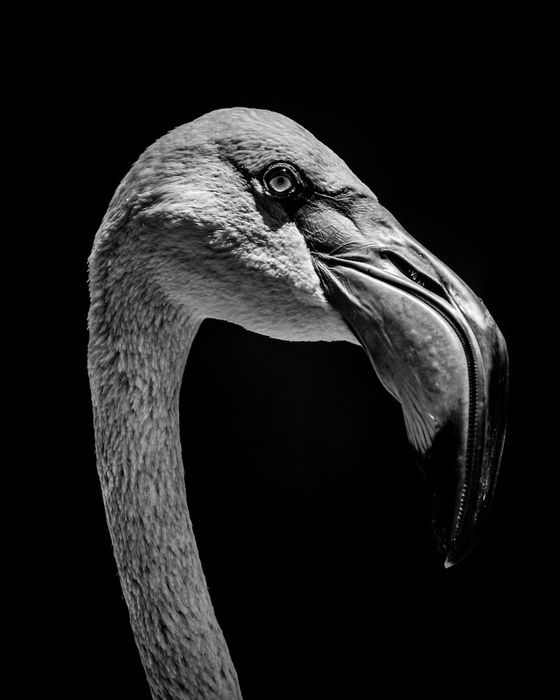 114 x 91cm/45 x 36"
This shows the head of a Chilean flamingo with a catchlight in its eye in black and white against a dark background. Shot with a Nikon D810 near the Iguazu Falls in Brazil in January 2016. This image won first place in Art Room Gallery's 'Nature' competition in March 2018 (see video), was a finalist in Fusion Art's 3rd Annual Animal Kingdom Art Exhibition in January 2018 (see video), was National Geographic's Photo of the Day on 9 October 2017 and received over 21,000 likes when it was featured on Instagram! It was also runner-up in The Daily Telegraph's weekly Big Picture competition and Outdoor Photography's Reader Gallery. 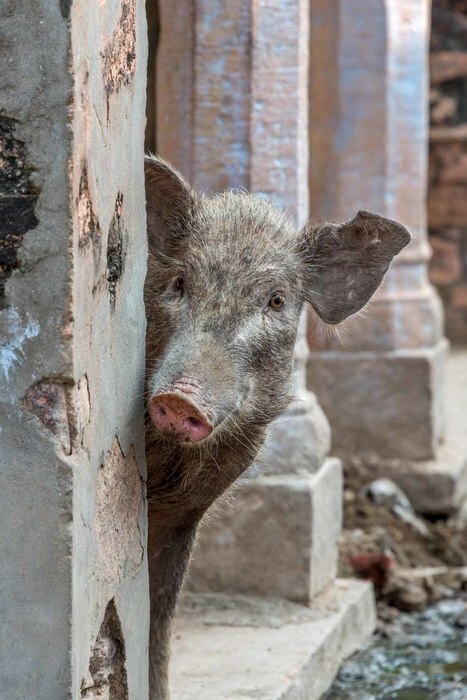 A pig is peeping out from behind wall on the street in an old Indian village. Shot with a Nikon D800 at Tordi Sagar in India in November 2013. This image was a finalist in Fusion Art's 3rd Annual Animal Kingdom Art Exhibition in January 2018. A Bengal tigress with a catchlight in her eye lies up to her neck in the dark shadows of a water hole. Her name is Maya 'The Enchantress', and she has orange and black stripes with white patches on her head. Shot with a Nikon D810 in Tadoba Andhari Tiger Reserve in India on 13 May 2017, which just happened to be my birthday!